These conversations will take place either at lunchtime on Thursday, April 4, 2019, or at lunchtime on Saturday, April 6, 2019. Please check the program for details. A recent AAUP analysis of federal data indicates that nearly three-quarters of all faculty positions are off tenure track, and increasing. We invite CAMWS members at all career stages to join us for an open discussion of the many implications that this new normal presents. Topics may include (but are not limited to): stability vs. tenure, the definition “professional contribution”, challenges of shared governance, etc. Antiquity in Media Studies (AIMS) is a developing community of scholars interested in promoting and supporting scholarship on various uses of the ancient world in modern media, including film, television, video games, comic books, and beyond. Our conversation will focus on our work to date, including developing resources in research, pedagogy, and professional development, along with conference outreach and developing a social media presence. We encourage anyone working in these areas of reception studies or interested in integrating them into their teaching to attend. With the recent interest in spoken Latin among high schools and higher institutions, many Latinists are wondering how to start speaking a language they only learned on paper. This discussion aims to provide suggestions on how to start speaking Latin extemporaneously, starting with a few techniques to try at home or in the classroom followed by a brief discussion on the many spoken Latin gatherings. The session will be lead by two spoken Latin enthusiasts, it is intended for Latinists with little to no experience speaking the language, but more experienced speakers are welcome as well. Are you a student, teacher, or scholar interested in Ovid and his reception? Please drop by this round table hosted by the newly formed International Ovidian Society to learn how you can get involved, share ideas for future events, and connect with potential mentors, mentees, and future collaborators. We warmly welcome your input on how we can best advance the study of Ovid, with attention to all media and time periods and a commitment to supporting students and younger scholars. Light lunch provided while supply lasts! 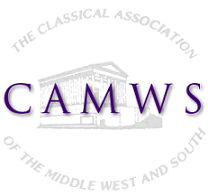 This session will focus on the CAMWS Latin Translation Contest, an annual competition open to both intermediate and advanced Latin students at both the high school and college levels. This discussion will focus on the impacts of recent changes to the examination, and will consider opportunities for future improvement. This is open to contest committee members, teachers whose students participate in the contest, and anyone else who is interested in the examination. This roundtable offers colleagues who either teach distance learning/online Classical Civilization and Language courses or who are thinking about offering online classes to meet, ask questions and benefit from sharing their experiences. Topics could include undergrad vs. grad distance courses; synchronous vs. asynchronous learning; beginning language courses, the hybrid classroom, best practices for instructional design, and creating a sense of community online. The organizers plan to begin with some structured discussion but will allow attendees to raise issues for conversation as well. Participants in this session will brainstorm ways to build and maintain a network or caucus of environmentally-inclined Classicists as well as desired outcomes for it (e.g. online resources for teaching and research, conference panels, edited volumes, etc.). We will also share ways that we have been integrating methods and theories from the environmental humanities into our own work. The trans-disciplinary nature of the topic will accommodate those who use archaeological, art historical, literary, philosophical, or historical approaches, broadly defined. This round table is an opportunity for the graduate community at CAMWS to gather together to discuss the ways in which graduate students can be better served by the organization. This is also a time for GSIC members to share their vision for the committee with their peers and colleagues, to advertise their programming at the conference (i.e., the panel, happy hour, and workshop), to provide updates on their current initiatives (e.g., blog, Facebook page, etc. ), and to recruit future members. All current and future graduate students are invited. There is a growing demand for educators to Indigenize their curricula. Progress is being made, yet Classical Studies has been slow to embrace this shift. This may be partly due to the lack of obvious connections between the ancient world and Indigenous matters. But the field has much to contribute. This roundtable discussion is meant to stimulate exchange on such issues as: how can we incorporate Indigenous content? How can we attract more Indigenous students? What are the particular needs of Indigenous students? What are some valuable resources for those beginning this effort? This roundtable will discuss the use of innovative technologies in Latin and Greek classrooms. In particular, I am interested in introducing round table participants to my use of the Marjorie Rork Lightboard at Butler University to create dynamic Latin review videos for use in intermediate and advanced Latin courses. This roundtable will subsequently provide a space for fellow teachers to share new technologies they are incorporating in their own classrooms so that we can think about how best to reach our students in Latin and Greek classrooms, both face to face and online. The recently formed Classics and Social Justice group seeks to bring together people with interests in both Classics and social justice. This roundtable aims to open up conversations about how we can combine our passions and expertise to address problems of (social, educational, economic, racial) inequality . Some topics of discussion will include: Should we use our positions in the academy as a springboard for activism? Do academics and university communities have a moral commitment to people outside their classrooms? What kinds of engaged work helps us foster our communities? How can we use art as an instrument of social justice? How can we move from teaching students about leaders in antiquity to developing them as leaders in their own right? The goal of this roundtable discussion is to share ideas about assignments, syllabus templates, and teaching strategies that Classics instructors at all levels can use to incorporate leadership development into their courses. Our conversation will lead to the creation of an online, public, living teaching resource list hosted by Kallion Leadership, a new organization dedicated to developing better leadership across all sectors and communities through the study of the humanities. Bolchazy-Carducci is pleased to briefly introduce LUMINA, an interactive learning tool, to our teaching colleagues for their feedback. We’ll present its student-friendly features for Latin for the New Millennium: Guided Language Facts that give immediate feedback, mouse-over vocabulary lists that facilitate mastery, replayable crossword puzzles that drill derivative work and its instructor-friendly features: automatically graded quizzes and the integration of scores into learning management systems or Excel. LUMINA‘s reformatted Artes Latinae is an up-to-date online self-learning program. At this roundtable we will talk about the logistical aspects of our annual meeting that people would like to continue or see change. We can consider the results of years of survey and attendance data that tell us what members want and provide immediate feedback on whether a desired change is feasible or if there are some complicating factors. With this discussion we hope to foster a safe environment for Classicists to make known their desires in the most direct way possible while simultaneously working out how those desires might become manifest in future SCS meetings. The traditional dichotomy between East and West continues to inform the way many scholars approach classical antiquity, even though ancient Greece and Rome were part of the same cultural milieu as the ancient Middle East. Comparative studies, interdisciplinary collaborations, and a willingness to question conventional paradigms will ultimately lead to a much more dynamic understanding of the Greco-Roman world. This round table discussion will explore ways to move beyond the limiting dichotomy between East and West in research and teaching. Who Owns the Ancient World in the College Classroom?